The beginning of the book explains to the reader what maps are, then goes into discussion about why we need them. The information moves into the numerous maps that people use every day such as street maps, town maps, and country maps. The reader will learn more about understanding scale, longitude and latitude lines, and making maps using alternating tools. The section on drawing maps heads up another section explaining contour lines, reviewing older maps, and how the world was viewed hundreds of years ago. Map keys and how symbols are used are explained, so is how compasses can be used in telling directions on a map. Map projections are another theme. This section explains how the earth appears using flat maps, underwater maps, and weather maps. We learn that people can create maps of underwater canyons or they can even map the stars. In the back of Discover Science Maps and Mapping are activities that can be done in the classroom or at home. Readers can make a magnet and create different maps. There is a glossary in the back of the book, a parent and teacher’s section, and a “Did you know?” section. The pages are designed and broken up into a similar fashion to the other books in the rest of the Discover Science Series. 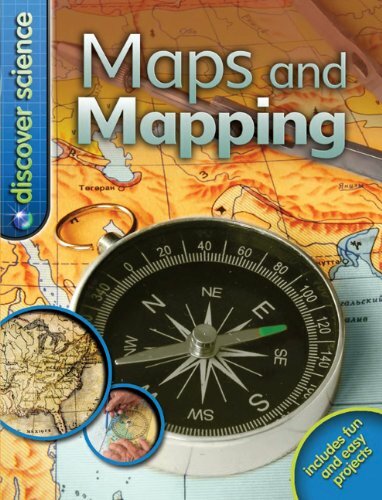 Overall, this book gives a plethora of basic information about maps and mapping. It scratches the surface of many topics, but nothing in too much depth for the target age, 9–12. The pictures throughout the book show various maps and pictures in detail that will interest the reader. There are a few minor quibbles with this book. This book is meant for children in that K–5 school-age group, but even so it would have been nice to see more detailed information on a few of the topics. The book did its job on relaying a tremendous amount of information about maps and mapping, but there was some basic information left out. In the map scaling section, it neglected to show what the map scale on a map actually looks like and how the reader can then use that scale to measure distance on a map. When discussing compasses and direction, information and pictures about maps having a compass rose and the intermediate directions were left out. Though compasses are used for finding directions, the most popular way to find directions these days is by using a GPS. Many vehicles have some type of GPS system in them, and this information is something that majority of children can relate to because they have seen it actually working in their parent’s vehicle. More explanation about that would have interested children as opposed to information about using a compass. The discussion was also limited in newer technology and the use of satellites. Though certain added information would have benefited Discover Science Maps and Mapping, it does cover lots of valuable information regarding our everyday view of the planet—whether looking at the stars or viewing the world from under the sea or by land.